A very fun exersice with beautiful drawings. 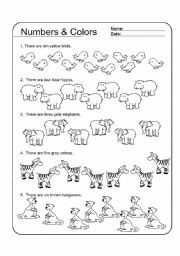 Children have to read, and paint the correct number of animals. 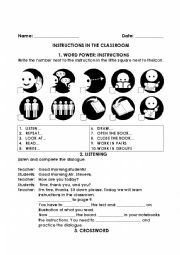 A nice worksheet to teach classroom language, particularly the rules it is always important to keep in their learning environment. This one was very fun for my students! 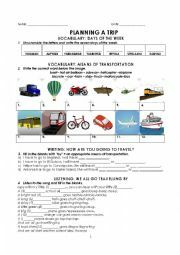 With this worksheet students get to review the days of the week, twelve means of transport (air, water and land), listen to a song (link to the youtube video in the key section), read a trip description, plan a trip and write an e-mail to a friend. 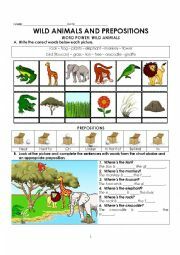 This worksheet is quite short and easy to follow. 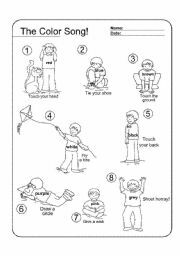 It is great for the beggining of the school year: students get to listen, read and write to instructions which are common in the classroom and in textbooks as well. 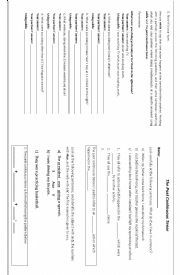 A very fun worksheet to explain the use of the past continuous tense. It has very nice original drawings, and fun exercises. Something interesting about this worksheet is that it folds like a magazine if you print it on both sides of the page. 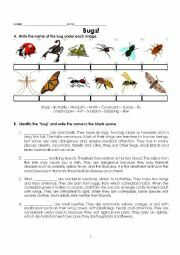 A short worksheet featuring twelve common bugs and four descriptive readings in which students have to identify the bug described. It has nice pictures. 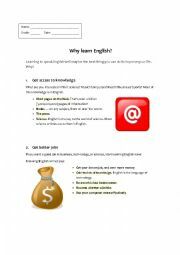 This is a very useful ppt to remind students about basic content. The words appear as you click, so they have to guess first what the answer is according to their previous knowledge. Take a look at it, it won´t dissapoint you. This is a wonderful ppt. It contains photos and descriptions of the most dangerous kinds of food, beggining with blood clamps and ending in McDonald´s. Kids will love it. It is great as an opener to motivate students when you are teaching different kinds of food and healthy habits. This is a very simple and brief ppt, which includes vocabulary related to nature and some exercises to practice passive voice.